At Myshape Lipo, we love that we are fortunate enough to change the lives of each and every patient we treat. This is very rewarding and shapes who we are. We pride ourselves on a high level of satisfaction from our patients. We enjoy phone calls from our patients weeks and months after their procedures to tell us how happy they are with their outcome. Our staff really does care, which is why we also make an extra effort to give back to our community. Below are some of the examples of volunteer work that our staff has performed. 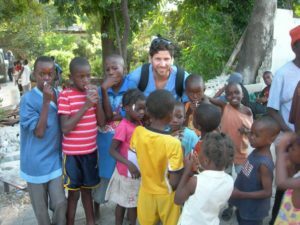 One week after the initial 8.1 earthquake occurred in Haiti, I was given the opportunity to help and I jumped into action. A local philanthropist offered his private jet to fly our small private group of doctors and PA’s to Haiti to offer medical services. We had no real plan, nor did we have any idea what to expect, but we were willing to help in any way possible. My group consisted of Dr. Edward Prince (Orthopedic surgeon), Colby Petersen PA (Cardiology), Dr. David Grygla (family practice) and myself Trevor Schmidt PA.
We had one day to prepare and collect supplies. In that short time period , we were able to collect and bring over 500 pounds of medical and surgical supplies. When we arrived in Haiti, the airport was in ruins. The control tower consisted of 2 air traffic controllers sitting on a park bench in a grass area on the runway. We were fortunate enough to link up with another non-profit group called “Team Rubicon,” who gave us shelter and transportation. We stayed in tents at a local church compound. It was a secure compound and we had food and water available. Since we had an orthopedic surgeon with us, we went to the local hospital in Port Au Prince where we felt our services would be useful. The hospital that we went to was deemed unsafe, but if we wanted to help any patients surgically we had to use their operating rooms and any supplies we could get our hands on. Our group helped about 6-10 surgical patients per day. The most common injuries were broken bones and severe infections requiring amputations. We were very limited by supplies and lack of sterility, but we did our best with what was available. Supplies were coming in on a daily basis, so each day was a little different as far as our capabilities. We also took a day and a half to go to a local church in Port Au Prince to help with primary care type issues. This was very rewarding, the kids were so happy to see us and it helped boost their moral. There were approximately 200 people living in tents and sleeping outside at this church. Since there was no trash pick up, they had a big problem with garbage piling up. For sanitary purposes, I decided to organize all the children to help clean up their living conditions and pick up all of the trash to be burned on site. I also had the opportunity to play soccer with the local kids and teach them a few tricks. The kids latched on and I had at least 3-4 kids holding my hands the whole time we were there. It was heart breaking to see the conditions they were forced to endure. But somehow, they kept themselves busy and tried to keep the moral upbeat and positive. The Haitian’s are very strong people and it was inspiring to witness how they moved on with their lives despite the magnitude of this disaster. The devastation and poverty in Haiti was astounding. Nearly 80% of the structures were completely leveled due to the poor construction. Many of the people already lived in shacks or on the streets before the earthquake. In the week that we were there, we saw the resilience and inner strength of the Haitian people. They began rebuilding and cleaning up the streets in an attempt to get things back to normal. The people really came together to help those that had lost their families members as well as the children that were orphaned. The experience will stay with me forever and I will never forget the smiles on the faces of my patients and their supportive families. The people were extremely grateful and polite given the situation. Nearly everyone had a family member that died. The services we offered these people were literally lifesaving. Most of them had no home to go back to, so they slept in tents in front of the hospital. With the help of other medical professionals from around the world, we offered shelter, food and medical services When it was time to leave, we had no specific plans to get home. There were military cargo planes that were flying Americans back to the states for free. There were also private jets flying in and out bringing supplies. It was still very unorganized at this time and we tried to approach the private jets to hitch hike and get back to the US. We were fortunate enough to hitch a flight out with a wealthy non-profit organization that was bringing wheelchairs and medical supplies. The flight home was an experience in it’s self. I actually had the opportunity to sit in the Captains seat and fly the plane for a short period of time. This experience was something that I will never forget and it has changed the way that I live my life and view people I help. I know that the people of Haiti are still a long way from normal, but it was very rewarding to be able to change the lives of the people that we helped. My outlook on charity was taken to a whole new level. The opportunity to have such a direct impact on a patient’s life makes me want to give more. It’s given me a taste of the potential impact that I am capable of with my medical skills. This trip has filled a void in me that I didn’t even know I had. I feel that I have developed more passion for my profession and an empathetic attitude toward my patients. I realize that people come to me for help and it’s my job to make them feel better.